On Saturday evening, after the battle, the entertainment continued at the Abbey. There was a recreation of the storming of the abbey, trials and mock beheadings – which I unfortunately missed because I had to pop back to Gloucester to feed my dog. However, I did arrive back in time for the special candle-lit Compline service. There are no photos of this because I felt it would be disrespectful (although others didn’t have the same ideals) but I can tell you that it was beautiful. For me, the special part was that the choir dressed as monks and sang plain chant – very evocative. One nice touch was having the names of deceased, past re-enactors read out, as a sort of memorial. In addition to the Compline service, a family eucharist was also carried out on the Bloody Meadow. I didn’t attend but I’m sure it paid respect to those who died in 1471. 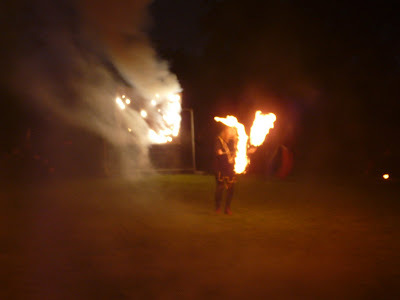 Later in the evening, in the vicarage garden, there was a pig roast and a ‘fire theatre’ by Theatre of Alchemy. This talented group of entertainers not only could juggle, fight and swallow fire in a York vs Lancaster themed ‘play’ but also engage in a very funny ad lib performance when we all arrived at the rope barrier half an hour early! By the way, I never want to hear ‘Whose Pigs are These?’ again – the darn song has been stuck in my head all week since that night!! This is where the camera decided to get all artistic on us. By the way, this girl was fantastic – near the end of the show she was happily hula-hooping with a hoop that was on fire. More artistic camera-work (!) 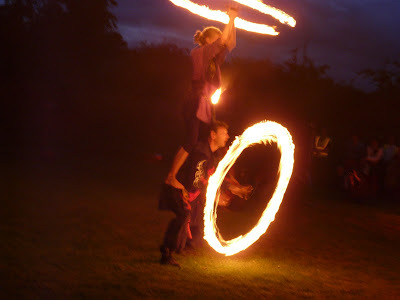 – but that is someone juggling with fiery batons – honest! The lit up bit behind is a fire-work display saying ’25’ to celebrate the festival’s 25th year. 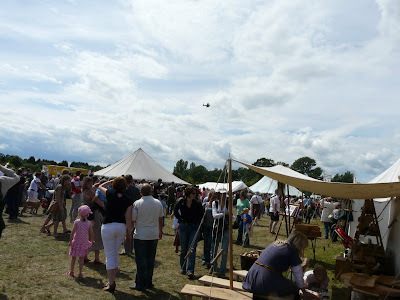 A general view of the fair with some of the many stalls. 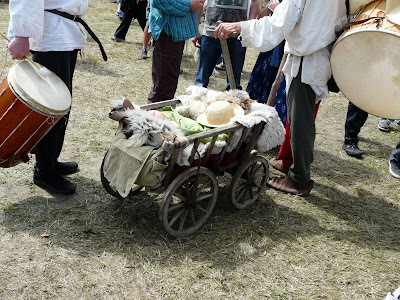 There was a wide selection of re-enactor’s goodies there from weaponry to shoes, armour to cooking pots, as well as the time-honoured ‘alternative’ stalls selling pagan jewellery and the like. 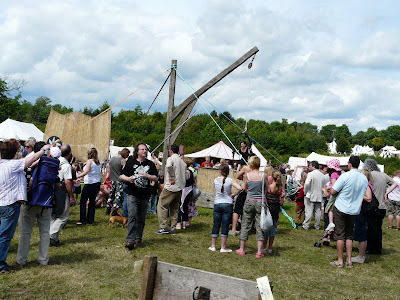 I always see Tewkesbury fair as a cross between a medieval market and a new-age festival. In fact I did hear someone describe it as ‘Glastonbury without the bands’. This was taken on the Sunday, which, as you can see, turned out to be hot and sunny. Oh yes, and that blob in the sky is actually a Lancaster, departing from the Royal International Air Tattoo at Fairford which was sadly cancelled due to the ground being too wet. Ye olde ducking stool! Despite repeated bribes from my mother and daughter, they were quite happy with their own wench to duck and didn’t want a replacement! 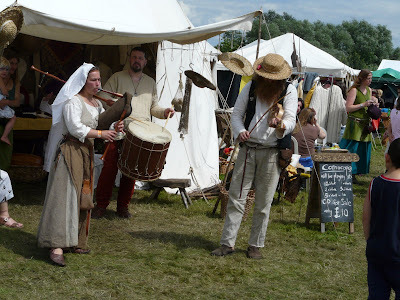 Medieval music was everywhere and provided great background music to the event. 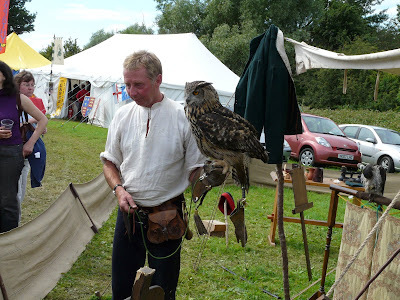 Is it me or does that eagle owl look hungry? You have to look closely, but there is a small child asleep in that ‘pram’. It was so cute that I couldn’t resist a photo. It is also precisely the way I felt after 2 days of walking up and down the fields at Tewkesbury – in fact that child was in great danger of being turfed out! Tagged Tewkesbury Medieval Festival. Bookmark the permalink. 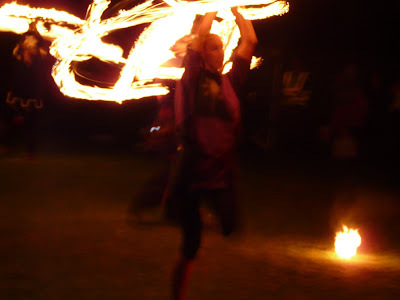 The pics of those firey-twirly things are great! Love the owl, too.